Libyan President Mohammed Magarief said on Sunday that about 50 people have been arrested in connection with the deadly attack on the US consulate in Benghazi last week, which he said was planned by foreigners linked to Al Qaeda. The attack on Tuesday in Benghazi came amid protests over a video made in the US that Muslims saw as blaspheming the Prophet Mohammad. It resulted in the deaths of the US ambassador to Libya and three other Americans. Magarief told CBS News that some of the suspects - including those who planned the attack - were from outside Libya and mentioned Mali and Algeria. He said some had links to al Qaeda and described other attackers as being affiliated with the group or sympathizers. "It was definitely planned by foreigners, by people who entered the country a few months ago and they were planning criminal acts since their arrival," Magarief said in an interview on CBS's "Face the Nation." 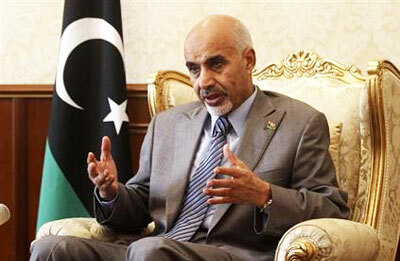 He said the security situation in Libya remained "difficult" for Americans, as well as for Libyans. The US wants the FBI to investigate the consulate attack, but Magarief said it may be too soon to send in investigators. "It may be better for them to stay away for a little while until we do what we have to do ourselves," he said.